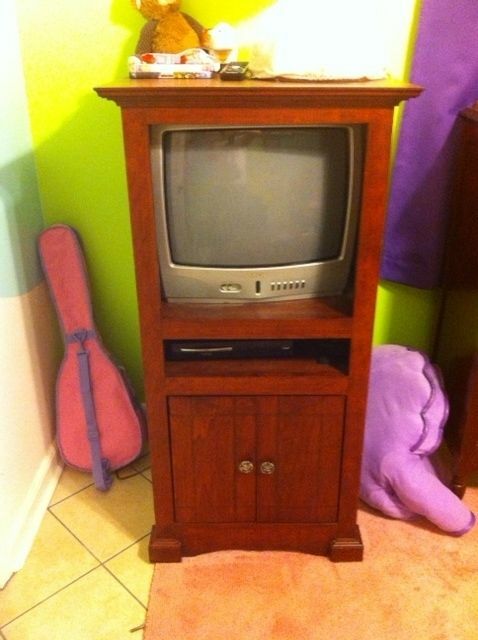 This television cabinet was commissioned by a couple for their child's bedroom. They wanted to utilize and existing television set but was concerned about the child pulling the set over. This cabinet was designed so that the TV could only be installed and removed from the back. The frame was placed so that the TV cannot be removed from the front of the cabinet while not interference with visibility. Once the TV is installed, the cabinet can then be attached to a wall with a set of "L" brackets. This insures that neither the TV nor the cabinet can be pulled over by the child.